The tumor has transformed its outer layer to mimic lymph node tissue to avoid detection by the immune system. 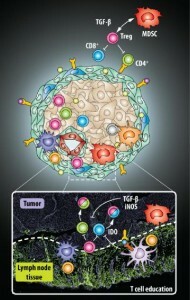 Researchers from Switzerland’s Ecole Polytechnique Fédérale de Lausanne (EPFL) published a study in the March 2010 issue of Science explaining how tumor cells avoid being destroyed by the immune system. The researchers believe that knowing how cancerous cells avoid the body’s immune system could lead to a future understanding of how to use the body’s natural defense mechanism to destroy cancerous cells. Tumors make themselves and the surrounding area seem perfectly normal by disguising themselves as lymph nodes, which are a key part of the immune system that filters the blood and traps foreign particles. Due to the disguise, the immune system is not phased and has no reason to take any destructive action on the cancer cells. The researchers focused on a protein in genuine lymph nodes that attracts cells and instructs them to carry out defensive functions for the body. Some tumors make their outer layer, with which the immune system would come into contact, appear as lymph node tissue by secreting this protein that the researchers were studying. Since the tumors secrete the protein, they attract immune cells. The immune cells are tricked into thinking the tumor is healthy rather than foreign. Thus the tumor is not destroyed by the immune system, allowing it to grow and spread. According to one of the researchers, Jacqui Shields, the concept that tumors mimic lymphoid tissue to alter the host’s immune response represents a new understanding of tumors’ interactions with the lymphatic system. This will possibly open up a new area of study, and hopefully open up new understanding for cancer therapy.